As the backlash against the Salvation Army continues, activists have created a “voucher” you can drop in the bell ringers’ red buckets this holiday season to stand up for LGBTQ rights. In 2014, our sister site, Queerty, exposed two internal Salvation Army USA documents that laid out exactly how the religious org planned to battle the negative publicity. The memos described their plan for a “strategy of containment” that included whitewashing their past, confusing potential donors, and refusing to take responsibility for their horrendous history of discrimination. In short, they’ve tried to sweep their past under the rug when they could end the whole thing by simply apologizing and promising to do better. Without the apology, any attempts they make will be met with skepticism. Instead, the Army has now apparently instructed employees to simply not talk about their opinions or beliefs on the subject. Feel free to download and print out the voucher to use yourself. If you do, let us know where you slipped it in a bucket in the comments section. 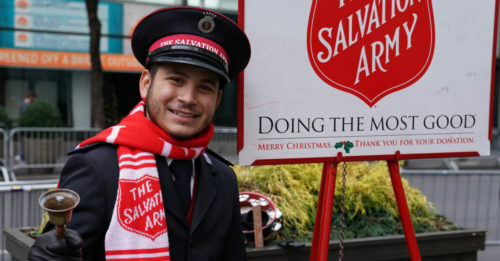 A voucher activists are encouraging people to drop in the buckets of Salvation Army bell ringers.